Sweet potatoes are planted after the last risk of ground frost, around the beginning of June, and they are harvested late September. Throughout summer, the crop is covered with a perforated plastic sheet to store the heat during the day as much as possible. At harvest time, everything is done manually because the skin of the potatoe is very fragile. After harvest, it goes directly to storage, where it is stocked in a “hot room” for 24h to harden the skin. It is then packed and delivered in your favorite IGA. Since 2001, Onésime Pouliot Farm stands out by being the only sweet potatoes producer on a commercial scale in Quebec. Depending on the varieties, the peel and flesh of the sweet potato can be white, yellow, orange or purple. The sweet potato is particularly rich in vitamins A and B6, copper and manganese. You can use it to substitute the regular potato in many recipes. It is very important to store the sweet potato in a dry place, without light and at 13 degrees Celsius. 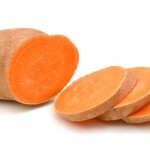 Cooked sweet potatoes can be stored in the refrigerator for 4 or 5 days in a closed container. Sweet potatoes harvest is done in September. It is possible to find our products in IGA supermarkets between October and March. It is also possible to get our vegetables directly at the farm, at the Île d’Orléans.